The Auto-Greet feature is used to play an announcement to every caller to the inbound number where you have enabled the feature. This feature is most often used to play an announcement like “This call is recorded for training purposes“. You may upload a .wav or a .mp3 audio file from your computer into turboDial. Please visit the Hosted Voice page in your turboDial Management account to find that upload form. Or you may record the announcement using the “Recorded Msg:” section of your turboDial Panel. The instructions here explain how to make a recording. Once you make that recording you must modify its name to include the word autogreet to inform turboDial that this recording should be available to choose from when you are configuring the Auto-Greet feature onto an Inbound Number. Choose a number in the “Inbound&SMS” selector and click the red pencil button to configure it. This is the third screen you arrive at after clicking the “Update & Next” button twice. The top section of this screen, highlighted in the image above, is the Auto-Greet feature. 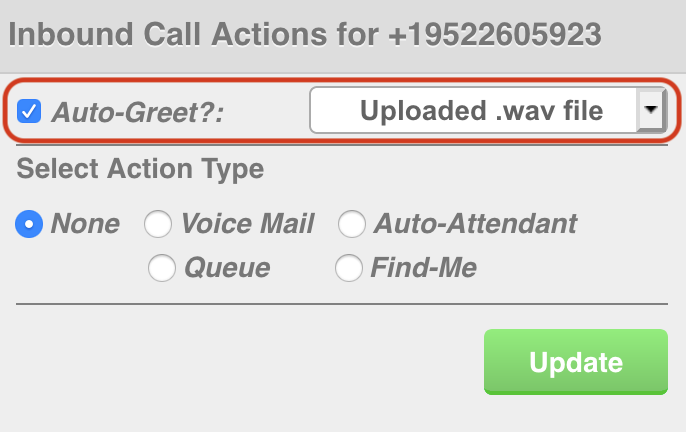 When you have completed any other changes you need for Inbound Call Actions features you will click the Update button. 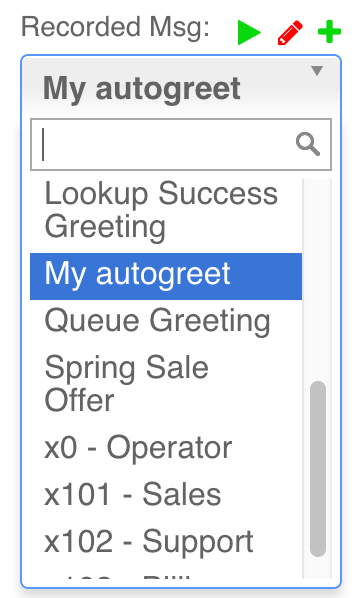 The Auto-Greet announcement is now active on the Inbound Number you just modified. Please make a call to that number to verify the announcement sounds the way intend.